On May 11 the first SpaceX Falcon 9 Block 5 rocket launches from Kennedy Space Center's Launch Complex 39A. A NASA safety panel announced support for the company's "load-and-go" fueling approach, saying it could be used on future commercial crew launches. WASHINGTON — Members of a NASA safety panel said May 17 they believed that a SpaceX approach for fueling its Falcon 9 rockets known as "load-and-go" could be used for future commercial crew missions. At the meeting of the Aerospace Safety Advisory Panel (ASAP) at the Kennedy Space Center, panel member Brent Jett said he expected NASA's commercial crew program would soon make a decision on the sequence of loading propellants and crew for SpaceX commercial crew missions. That approach, though, is contrary to previous practices in NASA human spaceflight, where rockets are fueled prior to allowing astronauts to board the vehicle. 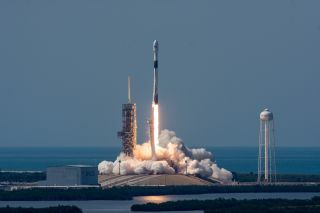 Thomas Stafford, a former astronaut who chairs the agency's International Space Station Advisory Committee, sharply criticized the SpaceX plan after a Falcon 9 exploded on its launch pad during preparations for a static-fire test in September 2016. "There is a unanimous, and strong, feeling by the committee that scheduling the crew to be on board the Dragon spacecraft prior to loading oxidizer into the rocket is contrary to booster safety criteria that has been in place for over 50 years, both in this country and internationally," Stafford wrote in a December 2015 letter to NASA released after the pad explosion. Jett said that ASAP received a report recently from the NASA Engineering and Safety Center than examined the issues with load-and-go, including some "hazard causes" not previously identified. That report "proved very valuable to the commercial crew program," he said. "My sense is that, assuming there are adequate, verifiable controls identified and implemented for the credible hazard causes, and those which could potentially result in an emergency situation, or worse, loss of crew and vehicle, it appears that load-and-go is a viable option for the program to consider," he said. Other ASAP members offered similar opinions. "It appears that, if all the appropriate steps are taken and it addresses the potential hazards, the risk of launching crew in the load-and-go configuration could be acceptable," said Patricia Saunders, chair of the panel. George Nield, another ASAP member and former associate administrator for commercial space transportation at the Federal Aviation Administration, recommended NASA look at overall safety, not just of crews on the spacecraft. "Not only crew safety, but also ground crew safety, is an important factor," he said. "Where are the risks, and how can they be mitigated, and what is the best overall sequence for safety of the whole?" In a conference call with reporters May 10, SpaceX Chief Executive Elon Musk downplayed any concerns about load-and-go, saying that he felt that SpaceX could fuel the Falcon 9 either before or after loading crew. "I think that issue has been somewhat overblown," he said. "We certainly could load the propellants and then have the astronauts board Dragon. That is certainly something we could do. But I don't think it's going to be necessary, any more than passengers on an aircraft need to wait until the aircraft is full of fuel before boarding." The load-and-go issue is separate from another issue involving a redesign of the composite-overwrapped pressure vessels (COPVs) used to store helium to pressurize the Falcon 9's propellant tanks. The 2016 Falcon 9 pad explosion was blamed on a flaw in a COPV that allowed solid oxygen to form between the composite overwrap and liner, which triggered an explosion. "Whether you load the crew first and then propellant, or propellant and then crew, either way the COPV issue has to be resolved," Jett said. "While some people like to link those two issues, I think really you have to get comfortable with the COPV, then look at the hazards associated with the transient of having the crew on board during fueling." "If you can adequately control those hazards," he added, "there are some very positive aspects to loading the crew first." Jett noted that NASA and SpaceX are "laser focused" on developing a safer COPV. "The panel has consistently maintained that understanding the behavior of the COPV in the densified cryo environment and identifying all the potential ignition scenarios is critical to controlling that potential hazard." Musk, in the May 10 call, said that SpaceX has a fallback plan if the COPV redesign effort fails, replacing them with Inconel spheres. However, he said that he expected the redesigned COPVs to be approved for use on crewed Falcon 9 flights after considerable effort by the company's engineers. "This is by far the most advanced pressure vessel ever developed by humanity. It's nuts," he said. "The top engineering minds at SpaceX have agonized over this. We've tested the living daylights out of it. We've been in deep, deep discussions with NASA about this, and I think we're in a good situation."